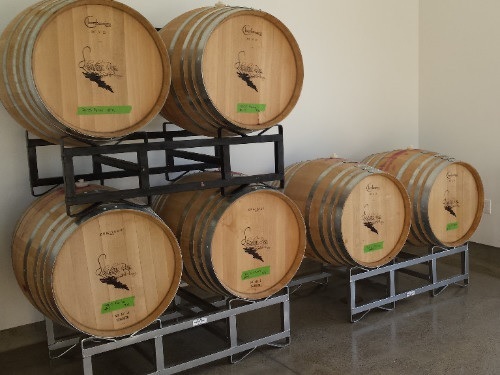 Visitors to the Shadow Run Vineyards and Winery Tasting Room often ask about the dozen or so wine barrels stored along the walls. Yes, they do contain wine. These are the wines that have not completed the secondary fermentation. As everyone knows grape juice goes through a primary fermentation when sugars turn to alcohol. Not everyone knows that there is another fermentation that occurs after the primary fermentation, called malolactic, in which the sharp malic acid in grapes is converted to softer lactic acid. As a result the wine tastes less crisp and more creamy. All red wines go through malolactic fermentation, but white wines are a different story. The winemaker decides whether she wants a “softer” or a “crisper” style white wine and if “crisper” is the choice, then the wine is not allowed to go through malolactic fermentation. However, Susan, the winemaker at Shadow Run Vineyards, wants softer for most of the whites. The reason the barrels are in the tasting room is that the malolactic fermentation prefers temperatures above 60 degrees (F) and their barrel storage room is too cold. Visit the Shadow Run Vineyard You Tube Channel and join Aaron Hunt, Susan and Les Evans for a behind the scenes look at life in Paso Robles Wine Country.